Sounds pretty great, doesn’t it? All that dream life? But on the other hand, as Tolstoy once said, “A quiet secluded life in the country, with the possibility of being useful to people to whom it is easy to do good, and who are not accustomed to have it done to them; then work which one hopes may be of some use; then rest, nature, books, music, love for one’s neighbor — such is my idea of happiness.” Which is a pretty goddamned beautiful dream too, is it not? These are two powerful and opposite poles of life — living in pastoral bliss, the productive solitude of the tranquil countryside; or being centered in all the noisy business of one of the world’s great cities, where at any moment something or anything can or will happen. And on that note, The Disagreement is pleased to announce Cow Pies Vs. Old Gum, a special reading to be held as part of the 2014 Wassaic Project Summer Festival. For this reading we’ve asked five writers from our past to join us and read pieces they feel best suit our theme. That is, the city versus the country, stuff that smells versus stuff that doesn’t, or perhaps just things you can step in. 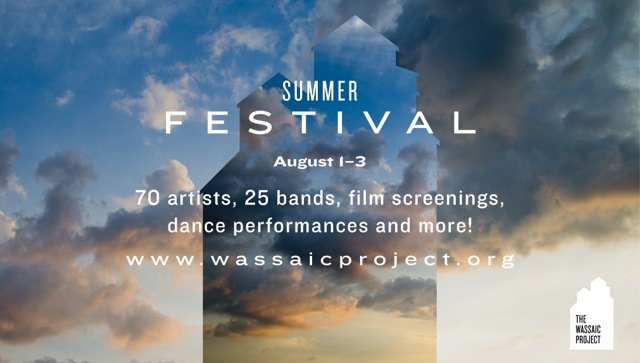 The Wassaic Project Summer Festival is a FREE, annual, multi-disciplinary celebration of art, music, dance, and community featuring over 100 artists, 25 bands, film screenings, dance performances, and much more! Housed in the unique buildings and property of the Wassaic Project, the festival escapes the white walls of traditional art spaces and focuses on site-sensitive installations and performances. The festival creates a weekend-long opportunity for artists and performers of all mediums to come together, exchange ideas, learn new things, and engage in a thriving community. Participants are encouraged to come for the day or stay the weekend, camping onsite. Programming is cutting-edge yet family friendly. The beautiful Hamlet of Wassaic is remarkably accessible from NYC and a short walk from the Wassaic MetroNorth train station. At the Lantern Inn. We’ll start at 3. Lizzie Harris’s debut collection is Stop Wanting (CSU Poetry Center, 2014). Her poems appear in All Hollow, Barrow Street, The Carolina Quarterly, Painted Bride Quarterly, Phantom Limb, Sixth Finch and VICE.com. She was born in southern Arizona, raised in Pennsylvania and currently resides in Brooklyn, where she’s a poetry editor for Bodega Magazine. Brittany Goss has published writing in Joyland Magazine, The Writing Disorder, Bellingham Review, and Grasslimb Journal. She holds an MFA from Colorado State University and has received support for her writing from the Vermont Studio Center. She is currently at work on a collection of short stories, which includes “A Simple Life”. Samuel Cooper is a writer, classicist, and freelance mathematician. His work has appeared in Hyperallergic, Linear and Multilinear Algebra, and other places. He grew up in Alabama and now lives in Brooklyn. His cell phone does not connect to the internet.